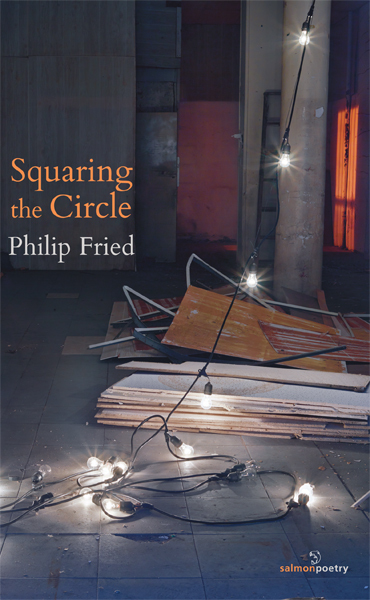 Philip Fried's Squaring the Circle is humorous and yet also mysterious in its evocation of esoteric physics and theology. The title poem presents a mystic/scientific quest for an impossible geometry as both a vaudevillian historical catastrophe and a way of understanding God. Throughout, Fried uses pastiche and the mashup of texts to explore historical moments and personal history. Behind its many forms and approaches, however, the book conveys the strong sense of a “persona"—the feeling, as Stanley Kunitz once said, that the poet has imagined a person who could write these poems. Philip Fried has published six previous books of poetry, including Early/Late: New and Selected Poems (Salmon, 2011) and Interrogating Water and Other Poems (Salmon, 2014). His poems and reviews have appeared in numerous journals. In addition to writing poetry, he edits The Manhattan Review, an international poetry journal he founded in 1980. Fried lives in New York with his wife, the photographer Lynn Saville. Kate Fox’s popular study of contemporary Englishness, Watching the English, applies not just to our national character but to a lot of contemporary English poetry too. English manners, she says, are either ‘over polite, buttoned up and awkwardly restrained or loud’. After a few drinks, our restraint can result in aggressive behaviour, particularly if our privacy is threatened.’ We fear being ‘straightforward’, she concludes, and ‘aspire to modesty’. In English poetry, these characteristics translate into a deep unease about political poetry. That is unless it’s performance poetry, in which case poets can express our resentments and frustrations, often wittily, provided they’re not too ‘posh’, ‘middle class’ or intellectual. Philip Fried, a US poet, whose Squaring the Circle, is published in unabashed Ireland, may seriously offend these ‘sensibilities’. He’s not only a very political poet, he also writes amusing but challenging poems about religion, science and philosophy. His collection is a great read if you like verse packed with allusions, puns, ideas and word-play. Some English readers may dismiss them as ‘willed’, ‘too forced’ or contrived. Not me, I had fun reading them. Have I been to Disneyfield, God wonders? After reading these poems, I couldn’t help but wonder if Fried believes in God. On reflection, I’d venture to say that he is agnostic but deeply affected both by God’s presence and his absence; God is ‘’indiscernible at his Director’s desk’. Fried likes poking fun at our conceptions of the deity ‘in his green plastic Gambler’s visor’ (‘Cloud of Knowing’ – the title echoing a medieval English text – and the image referencing Einstein’s comment about Quantum Mechanics – more of that in the collection’s second part). The trinity (i.e. ‘old-time religion’) is explored in his impious but not ungodly poem about carbon paper and ballpoint pens, ‘In Triplicate’. And so could go on and on and on……….’. My house, my rules, my ivories, my tombstones. The third part, Cutting Edge, moves between post apocalyptic monologues – including a parody declaration of independence by cybernetic systems – and pre-apocalyptic satires on US militarism. The technique Fried uses is to describe a process – like invading another country – in terms of something else (like the Passover story, or aeroponics – the airborne bombing version of hydroponics – or recipes like ‘The War on Leeks’). Registers get swapped around, metaphors extended. This is all highly entertaining stuff. This poem shows, on the contrary, that ideas (like foreclosure) can become things or define them. Bankruptcy is, after all, even more real to some people than a plum. ‘Interrogating Stress’ is more characteristic of his ingenious but knockabout approach. Stress is the subject of the narrator’s violent, illegal interrogation. In the process, of course, we interrogate stress as a social and verbal construct. We also learn stuff we might not have known about before. For example, I found out (thanks be to both Fried and Google) that the opposite of distress is eustress. Stress is called ’the aphetic / jihadi of PTSD’, a metaphor which is both metaphysical and uncomfortably political. I’ve fled the future to ghost the fugitive moment. The final part, The World’s Big Show, isn’t, as far as I can see, fundamentally different from the preceding section except that it is more focussed on domestic matters rather than foreign wars and apocalypse. Accordingly, it is the destination for several poems about flags. One uses the form of a mock problem page where various versions of the stars and stripes (a decal, a t shirt etc.) complain about their relationships. The second is about folding the flag, which has to be done in a particular way apparently, and features Apollo, one of a number of classical references in the poems, where mythological or historical figures from the classical world become actors in our own, another Audenesque feature of his work. This and other poems in this section concern the means by which US society structures our consciousness to accept its war games and destructive consumerism (cf Auden’s ‘The Shield of Achilles’ or ‘The Unknown Citizen’). ‘Package Insert’ for example predicates a hypocrisy drug by providing advice about its usage and side effects. Resistance to this establishment mind control is present in the form of his grandmother, watching US all-in wrestling and seeing how the contestants have become ‘avatars’ of American might. The section and collection ends with a poem ‘Hullabaloo’. Here the microscopic becomes political – with epidermal cells described as agents of health – a trope ( the body politic) that was also used by Auden in his late great poem, ‘Talking to Myself’. This is a brilliant book, full of fun, controlled anger and dazzling word play. It breaks the rules of English poetry because it enjoys – like many of us who moved on from humble backgrounds – ‘the life of the mind’. Once upon a time, this was the sort of poetry that could only be written by privileged people like Auden. It’s great to see Fried occupy and share a space once reserved for the upper middle class, with such zest, ethical passion and wit. Jonathan Timbers is a human rights worker and qualified solicitor. His poetry has been published in Neon Highway, Interpreter’s House, Pennine Platform and Oxford Poetry. From 2014-15, he was town mayor for Hebden Bridge and Mytholmroyd and has spoken about Ted Hughes’s war poetry at Ted Hughes poetry festivals in Mytholmroyd and Mexborough, South Yorkshire. He is one of the few people living in Hebden Bridge who has ever worked in a military tank factory.